The 2570-E is the ultimate industrial workhorse for serious cleaning or concrete blasting. It effectively strips all types of marine fouling, corrosion and coatings to bare metal. The unit is also effective for underwater construction and demolition projects, piling re-facing, jacketing and reconstruction, as the unit breaks down concrete. This unit is capable of achieving surface preperation stage SA.2.5. Also rated for off-shore use. 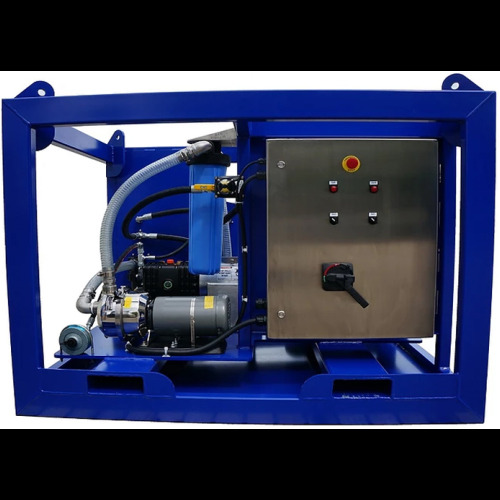 This unit comes equipped with a large industrial, multi-voltage, 3 phase electric motor with a 1 year manufacturer's warranty and a HPP industrial triplex pump boasting a 5 year manufacturer's warranty. The heavy duty powder coated steel frame comes with lifting eyes and fork lift slots. Effective on all industrial applications industry wide. Standard accessories include zero-thrust balanced gun, electric centrifical self priming pump, 15' of by-pass hose and 50' of 3/4" ultra high pressure hose. Unit can also be utilized as a 2 gun system. All electric units come in a 50hz or 60hz option.